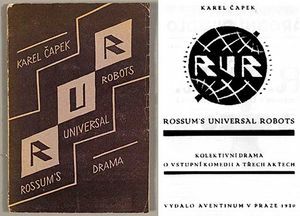 Szenenbild der Aufführung von Rossum's Universal Robots im Theater Garrick in New York 1923. 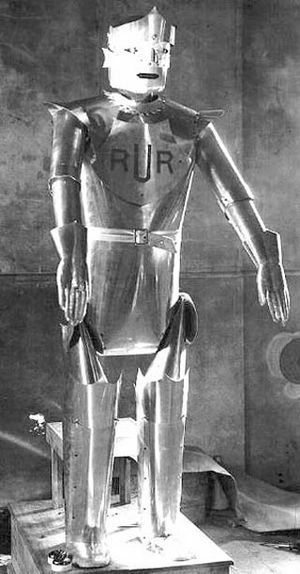 "Robot: There is something in struggle with us. There are moments when something enters into us. We receive thoughts which are not our own." FANUC LTD. baut seit 1972 Industrieroboter. Monatlich verlassen 2.500 Roboter die automatisierten Fabrikshallen, in denen Roboter Roboter montieren. 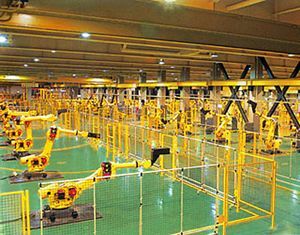 The International Organization for Standardization (ISO) definiert einen Roboter unter ISO 8373 wie folgt: "An automatically controlled, reprogrammable, multi-purpose manipulator programmable in three or more axes, which may be either fixed in place or mobile for use in industrial automation applications." Diese Seite wurde zuletzt am 5. März 2016 um 12:47 Uhr bearbeitet.